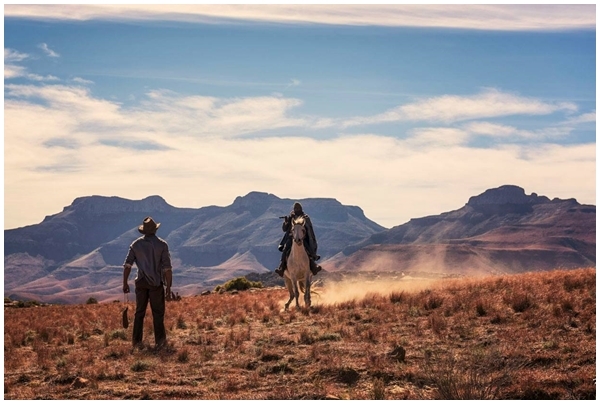 The great westerns have always contained socio-political threads, and Five Fingers’ loose allegory on today’s South Africa is edge-of-the-seat, and starkly human. Travelling through the Eastern Cape and Free State of South Africa in late 2009, and particularly the Maloti Mountain range on the southern border of Lesotho, Sean Drummond and Michael Matthews were struck by two things: the resemblance of the area – majestic landscapes, sweeping plains and rocky outcrops – to the world of the classic western films, and also by the communities surrounding it. Dotted across this landscape are tiny towns, many with European names – Rome, Barcelona, Hamburg, Berlin, Marseilles – in a throwback to their colonial settler roots. Connected by train lines, some comprise nothing but a station, a trading post, a hotel and a post office. For the larger ones, most not more than a few city blocks in size, the hub of town was traditionally a white space, with the local indigenous peoples of the area relegated to townships, workers quarters and tin shack shantytowns, often with poor or no water supply, ablutions, power or basic services. The death of these settler towns began long before the fall of Apartheid, with the train lines becoming obsolete, replaced with highways and a bigger focus on city living. After the advent of the new South Africa, many of those towns completely faded away, and in their place the townships began to rise up. The result is something much more proudly South African, and Matthews and Drummond made a commitment to travel the country, visiting these towns for inspiration. They found it akin to a new frontier, and in that was the parallel with the western. 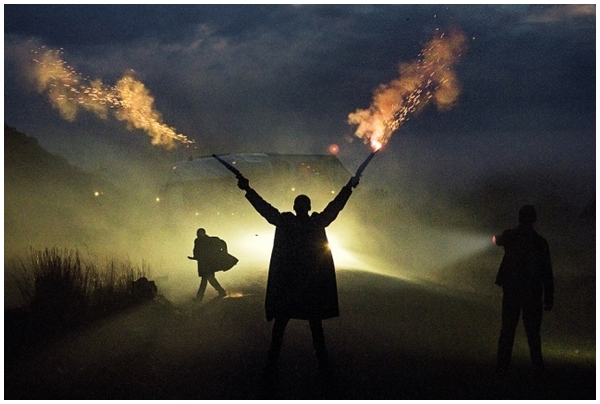 Five Fingers for Marseilles deals with the struggles and triumphs (over nature, crime and human nature) that affect communities on this new frontier, and the rich characters found in them. It contains many of the archetypes of the classic western – larger than life heroes and villains, an examination of the ideas of ‘good’ vs ‘evil’, conflicting human tendencies towards brotherhood and brutality and the themes of land and ownership, claim and legacy, and the urge to protect our roots – from even ourselves. Calling on his partners-in-crime and with new friends at his side, Tau reforms the Five Fingers. Standing against old allies and new enemies alike, they must put their lives at the greatest risk for the sake of Marseilles. It’s their duty to protect it. Even from each other. 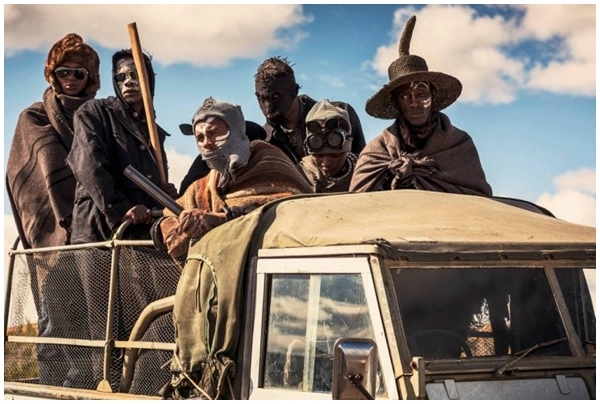 Drummond and Matthews set out to bring these themes into this South African landscape, touching on local culture and history, crafting a rich, emotional and thrilling story driven by compelling, complex characters unseen on local screens. The result is a story local in its details but universal in its appeal. Drummond has been a fan of the western for as long as he can remember, less so the action-packed crowd-pleasers and more the brooding introspection of films like Unforgiven, Once Upon a Time in the West and TV series like Deadwood – stories that simmer just below the surface, that explore the universal themes of man versus man, man versus himself and men versus the land. All stories are conflict, as the mantra goes, and in the western one finds almost the purest form. 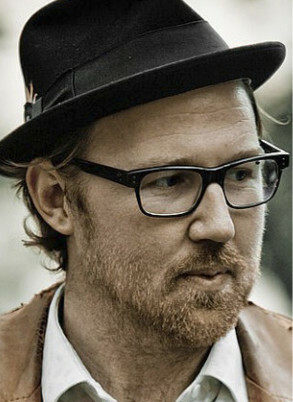 With a history in stage & performance, Sean’s visual sensitivity to pace, tone and character serve him as a complex screenwriter for his own Be Phat Motel Film Company and for the South African, and international markets, as a creative and conceptual producer and as an intuitive documentary director. His shorts Sweetheart and Wide Open and feature documentaries Lost Prophets and Outsider have screened extensively at festivals around the world. 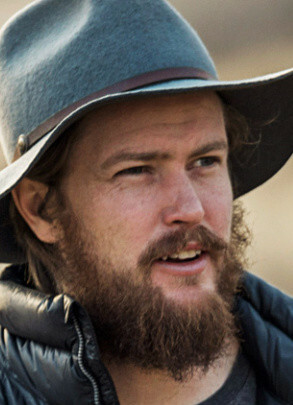 Projects in development include television drama series co-production Acts of Man and a high-octane feature adaptation of Charlie Human’s beautifully twisted novel Apocalypse Now Now. 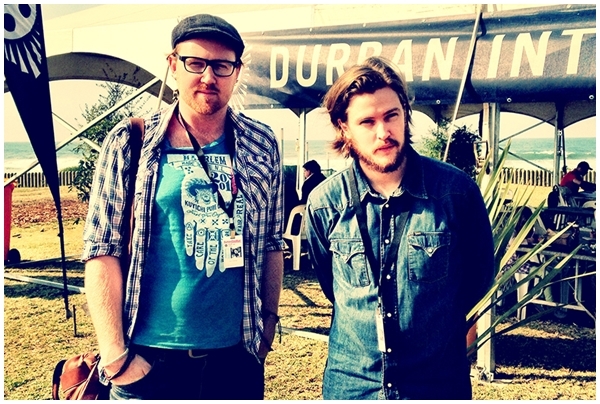 Sean is the founding manager of the Cape Town chapter of the shnit Worldwide Shortfilmfestival, celebrating, promoting and awarding South African and international short films yearly, and he sits on the festival’s international executive committee, pushing artistic collaboration and exchange between filmmakers from cultures all around the world. He continues to sit on Cape Town’s festival board. He has hosted panels on finance, co-production and distribution at international markets and has served on the Writers’ Guild of South Africa’s executive council. Sean hosts science, tech and sci-spec podcast Space Life and Other Dumb ideas. He’d like to go to space. Capturing the rich cultural mix of Sesotho and Xhosa was important to Drummond and Matthews, to honour the space and the people. So little seen on screen, the film offered a real chance to celebrate small town South Africa and present it not as the dry, impoverished communities so often represented in films, but a vibrant world, full of culture, colour and style and completely unique. It was a chance to look at land and ownership and history; a world to explore culturally, socially and politically, through the lens of genre. It was important to Drummond, Matthews and the creative team from the start that they approach the world humbly and openly, without projecting a viewpoint onto it, being especially cautious of appropriation or exploitation. 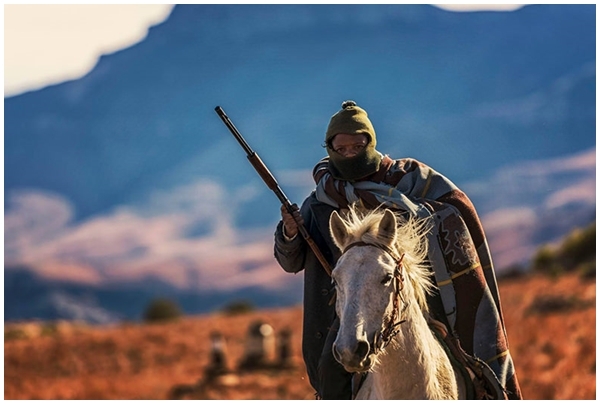 “We knew that by setting it in a small rural town, it lends itself to the Western, but more importantly it separates it from being seen as just an SA ‘crime story’. Seeing any kind of crime in South African cities brings up a pre-existing subjectivity that audiences can’t help but attach to the film. So by setting the film in a small rural town, it helps create more of a blank canvas for the story and characters,” says Matthews. The filmmaking team set out to ask questions about South Africa’s past, present and future, not making a defining statement about the culture or the country, but an offering of a gripping narrative that has larger themes and questions worked into it. It’s not an apartheid narrative, but present day South Africa is informed by its past, and the undeniable scars it left on the country are still felt today. It’s also a film that goes deep into human nature, complex as it is, and Drummond wanted to avoid clear-cut moral lines in any of the characters. ‘There Are No Good Men’ speaks to the conflicts inside each of them: how ‘good’ men can commit terrible crimes, even with the best misguided intentions, and how ‘bad’ men can rise up and stand together for good. And at the same time, the aim was to offer something simply gripping, thrilling, cool and iconic for a South African and a world audience. Drummond delivered the film’s opening sequence, featuring the young versions of the lead characters, to Matthews and the Be Phat Motel creative team first. “Sean is an incredibly talented writer,” says Matthews. “I have had the pleasure of working with him for 10 years, since our first collaboration while we were still studying. He has the natural skill of taking an idea for a scene and smoothly translating it into an authentic character moment.” The tone set, Drummond returned to Lady Grey yearly throughout the development of the project, writing much of the script on location. He immersed himself in the genre – both watching films and reading their scripts, to see how they had translated from page to screen. At this early stage, casting director Moonyeenn Lee came on board the project, casting her eye and net out to look for the best possible actors for the complex characters Drummond and Matthews were creating. Written in English, the film was always intended to play in a local language, and Basotho screenwriter Mamokuena Makhema came on board as a translator and cultural advisor, consulting on language, culture and nuance, and ensuring the dialogue in Sesotho captured the poetry and depth of the original script. Actors were given the freedom to look at their own lines and translations, too, and the film was written with the intention of allowing silence, allowing for removing dialogue and letting scenes play with emotional beats as per the script, but not necessarily the words themselves. In terms of story, characters and setting, the aim, from script stage, was to put something on screen that had never been seen in South Africa or from South Africa. The strength of the bonds with the core creative team on board the project meant that there was no doubt that the film would continue to strengthen through every stage towards production. It was on a scouting trip for a different project that Be Phat Motel Film Company’s Matthews and Drummond first passed a road sign for the town ‘Marseilles’, out in the middle of the predominantly farmland Free State province of South Africa. When they went on to pass signs for Barcelona and other European-named towns, they knew that there was something there that the majority of the country didn’t know about. Inspired, they planned a return trip, and in October 2009, with the bones of the story that would become Five Fingers for Marseilles in mind, they set out on an 8 000km journey across the country, visiting small towns and meeting locals, listening to stories and learning the histories of forgotten and contested spaces. Pre-GPS, with only a weathered map book to guide them, they followed a loose plan set to take them around the country in one month. Car trouble and a chance detour led them to Lady Grey, a town not on their original route plan. Arriving at sunset, at first sight it was everything they’d imagined for the film – a thriving, growing community, set into one of the most cinematic mountain vistas they’d seen in the country. They headed straight up the hill to ‘Top’ location – which would go on to become ‘Railway’ in the film, and spent an hour wandering the streets, meeting the residents and taking photographs. Warmly welcomed, they spent three weeks in Lady Grey and its neighbouring community Khwezi Naledi, researching, building relationships with everyone from local farmers to the mayor to community leaders and both the richest and the poorest in the community, and exploring the surrounding mountains and farmland. It was in Lady Grey that Drummond first committed an outline for Five Fingers to paper. Over the three weeks, the story took shape, informed by the real locations, people and stories, and by the time they left, Drummond and Matthews were inspired. Lady Grey is also the site of one of only three arts academies for schoolchildren in the country, and after spending time with the staff and learners and seeing the talent on show, Michael and Sean committed to making best efforts to cast all of the young versions of the characters from the town itself, when the time came. It was a risky challenge, knowing there would be a pool of fewer than 100 children in the right age range at any time the film went into production, for six roles, but for authenticity and in keeping with one of the earliest aims for the film – community building and leaving a legacy – it was a challenge they were willing to take on.